Immunology Microbiology Lab 1, Department of Human Physiology, Department of Zoology 2, Tripura University, Suryamaninagar - 799022, Tripura, India. ABSTRACT: Bromelain is a protease present in pineapple fruit and stem. It is reported that commercially available pure bromelain has anticancer, anti-inflammatory and other therapeutic effects. But there are few reports available on the biological activity of bromelain along with peroxidase which is present in pineapple fruit extract. The aim of the present study was to investigate the effect of bromelain with peroxidase from pineapple fruit against lymphoma cell line in in-vitro. Pineapple was purchased from the local market from Tripura. Bromelain isolated along with peroxidase and enzyme activity tested with the substrate. 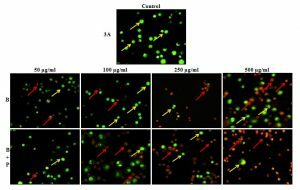 In-vitro cytotoxicity was determined by MTT assay, and apoptosis was determined by fluorescence microscopy, DNA fragmentation assay and by western blot analysis. 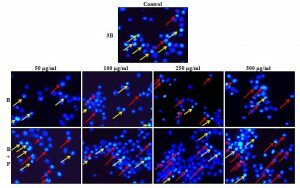 Fluorescence microscopy analysis and the MTT assay showed significant apoptosis of lymphoma cell after treated with bromelain along with peroxidase in a dose- and time-dependent manner and was more apoptotic than bromelain alone. This was further confirmed by DNA fragmentation assay. Furthermore, western blotting analysis confirmed the mitochondrial pathway is involved in apoptosis of lymphoma cells. We reported for the first time that the efficiency of apoptosis of bromelain along with peroxidase is much higher than the only bromelain. This result may hint to use bromelain plus peroxidase from pineapple as a potent natural antitumor agent. INTRODUCTION: Cancer is one of the most serious diseases in the twenty-first century. It causes uncontrolled growth and division of cells in the affected area or organ. Within very short time a huge number of abnormal cells accumulate in a particular site which ultimately affects the organ’s normal function. After certain times, these cells metastasize to other portions/organs of the body to affect them too 1. From a different approach, people are trying to prevent cancer and lots of drugs are used against cancer but no one is target specific and without side effects. Surgery, chemotherapy, cellular therapy or immunotherapies are common to treat cancer now. Scientists are trying to identify and characterize new anticancer agents to prevent the uncontrolled growth and metastasis 2, 3. From ancient civilization plants, plant-derived products were used for medicines in all around the world. For healing purpose different civilizations like Roam, Mediterranean, Egypt, Iran, Africa, China, India and America used the herbs. The systematic use of these herbs or the traditional medicines played an important role as a source of providing anticancer agents from over decades. The bark, stem, leaf, fruits of these plants have different active polyphenol compounds and different enzymes play a significant role in different cancers 4, 5. The other activities of various plant-derived enzymes like anti-inflammatory, anti-diabetic, anti-bacterial etc. were also studied extensively 6, 7, 8. As these medicinal plants have very little or no side effects in the body, or the plants are edible, so are interested to use their disease prevention potentiality against different diseases. The pineapple is the most edible fruit which is also used as a medicinal plant from many years by different community people in India. Pineapple is a tropical and most economically significant plant in Bromeliaceae family 9. The pineapple plant Ananas comosus (L.) Merr is rich in bromelain, a cysteine protease enzyme 10. Crown, peel and stem are the main source bromelain. It is composed of different types of thiol-endopeptidase and other non-peptidase enzymes 11. For the ailment of different diseases including fever, indigestion, and muscle pain etc. pineapple was used by different tribes as medicine. It is revealed that bromelain of pineapple has, anti-inflammatory, anti-fibrinolytic and anti-bacterial activities 12, 13, 14. It activates macrophage and NK cells by increasing TNF-α and also inhibits tumor cell proliferation, invasion and expression of CD44 surface molecules through inhibiting the expression of different genes which helps in tumor cell survival 15, 16. Bromelain acts against mammary carcinoma cells via inducing autophagy 17. It also triggers the activation of T and B cell 18. Tripura, a state from north-eastern part of India is one of the major cultivators of pineapple. This fruit contains a large amount of bromelain and peroxidase. Peroxidase is another enzyme also present in pineapple along with bromelain. Separation of bromelain from peroxidase is not a simple process. There are fewer reports available about the activity of peroxidase along with bromelain 19. No reports are available about the cytotoxic and anti-proliferative activity of bromelain along with peroxidase from pineapple against cancer cells. The present study focused on to compare the cytotoxic potential of bromelain alone and in combination with peroxidase isolated from pineapples of Tripura against Dalton’s lymphoma cells in-vitro. Raw Materials: Queen variety of pine apple were collected from the local market of Tripura. The Queen pineapple plant was authenticated taxono-mically by Prof B. K. Datta at Botany Department of Tripura University with collection no- TUH 2046. The fruits were thoroughly washed in tap water and stored in -20 °C freezer for future use. Chemicals and Reagents: Commercial Bromelain for positive control, MTT and DMSO were purchased from Sigma-Aldrich (St. Louis, MO). GAPDH, p53, BAX, Bcl2, cytochrome C and Bad antibodies were purchased from Abcam (Cambridge, UK). Secondary antibodies were purchased from Santa Cruz Biotechnology (Santa Cruz, CA), ECL-Clarity kit was obtained from Bio-Rad (USA). RPMI 1640, FBS (Fetal Bovine Serum), antibiotic solution and caspase-3 assay kit was obtained from Life Technologies (Grand Island, NY). Tissue-culture plastic wares from Falcon (Corning, NY). Guaiacol, Casein (Hammerstein grade), Hydrogen Peroxide, L-tyrosin, Coomassie Brilliant Blue, Trichloroacetic acid, acrylamide, bisacrylamide, ammonium persulfate, glycine, sodium dodecyl sulfate and bovine serum albumin were procured from SRL (Mumbai, India). All other chemicals used for the experiments were of AR grade and from SRL. Cell Lines: Dalton’s lymphoma ascites (DLA) cells were kindly gifted by Dr. N. Murmu from Chittaranjan National Cancer Institute, Kolkata, India. Preparation of the Crude Extract of Bromelain: The flesh part of pineapple were cut into small pieces and crushed in a blender with 0.1 M phosphate buffer (pH 7.2), maintaining the flesh - buffer ratio as 1:1 w/v. After filtration with cheesecloth, the extract was centrifuged at 10000 rpm for 20 min at 4 °C (Sigma 2-16 PK). The clear supernatant was stored at 4 - 5 °C until use. Acetone Precipitation: Acetone precipitation was done according to the procedure 20. The required volume of acetone was cooled at -20 °C and mixed with protein sample in acetone compatible tubes and kept the tubes at -20 ºC for 60 min. After incubation centrifuged the tubes at 5000 rpm for 10 min at 4 ºC. The supernatant was discarded and tubes containing pellet kept in inverted position for 15 min to remove excess acetone. Protein pellets were re-dissolved in 0.1 M phosphate buffer (pH 7.2) and vortex thoroughly. This sample was used to measure the total protein content, bromelain activity and peroxidase activity. Total Protein Analysis: Total protein was determined by Lowry’s method by measuring the optical density at 660 nm using BSA as a standard 21. Bromelain Activity Assay: Bromelain activity was determined by casein digestion units (CDU) using Hammerstein grade casein 22. The assay was based on the proteolytic activity of the casein substrate. Bromelain breaks peptide bonds and releases free amino acids after hydrolysis of protein. In this case, L-tyrosine was released from casein after hydrolysis with bromelain enzyme. Unhydrolysed substrates were precipitated with TCA and the precipitated proteins were removed using Whatman no. 1 filter paper. The absorbance of the clear filtrate was measured at 275 nm using spectro-photometer (Model: HALO Dynamica DB-20). Enzyme blank was used to avoid interference by enzyme solution. In case of blank reaction, stopping reagent (TCA) was added to the substrate before adding the enzyme solution so that all the protein got precipitated and there was no reaction of bromelain with the substrate. One unit of bromelain activity is defined as 1 μg of L-tyrosine released in 1 min/ml of sample when casein is hydrolyzed under the standard condition of 37 °C and pH 7.0 for 10 min. Peroxidase Activity Assay: Peroxidase activity assay was done according to the procedure 22. The substrate solution was composed of 1 ml of phosphate buffer of pH 6, 1 ml of 3 mM H2O2, and 1 ml of 15 mM Guaiacol. To the substrate solution, 50 μl of enzyme extract was added and the increase in absorbance at 470 nm was recorded for 10 min. Peroxidase activity was determined from the slope of the linear portion of the graph relating absorbance with time and expressed as ∆Abs470 min-1/g fresh weight. One unit of peroxidase activity is defined as the amount of the enzyme that causes an increase in absorbance of 0.001/min at 25 ± 3 °C. SDS-PAGE: Sodium dodecyl sulfate-poly-acrylamide gel electrophoresis was done using 12.5% gel in a Bio-Rad electrophoresis unit 23. Coomassie Brilliant blue staining was performed for the visualization of bands. Cell Culture: Dalton’s lymphoma is a murine transplantable T-cell lymphoma. This tumor was primarily originated in the thymus gland of a DBA/2 mouse at the National Cancer Institute, Bethesda, USA, in 1947 and then serially transplanted in the intra-peritoneal cavity from mouse to mouse 24. Dalton’s lymphoma (DL) cells harvested from Dalton’s lymphoma-bearing mice were cultured in RPMI-1640 medium supplemented with 10% FBS and antibiotic solution (penicillin 1000 IU and streptomycin 10 mg/mL) in 5% CO2 incubator at 37 °C. Cell Viability Assay: Cell viability was evaluated using the MTT assay. DLA cells (4 × 105 cells / well) were seeded in each well of 96-well plates for 4 h. After 24 h of incubation with various concentrations (0-500 μg/ml) of bromelain and bromelain plus peroxidase, the MTT solution (5 mg/mL in PBS) was added at the concentration of 10 μl/well. The plate was incubated for additional 4 h at 37 °C and the formazan crystals produced were dissolved in 100 μl of DMSO. Absorption was measured by an ELISA plate reader (BioTek, USA) at 595 nm 25. Cell Morphology Analysis by Fluorescent Microscope: DLA cells were isolated from DLA bearing mouse and washed with PBS. 1 × 106 cells/mL was treated with various concentrations (0-500 μg/ml) of bromelain and bromelain plus peroxidase for 24 h at 37 ºC and 5% CO2. After incubation, cells were washed and stained with 20 µL Ethidium bromide (100µg/mL) and 20 µL Acridine orange (100 µg/mL) in a ratio of 1: 1 26. The cells were then examined on a slide under a fluorescence microscope Fluorescent images were scanned using fluorescence microscope (Leica DM 4000 LED). DLA cells were isolated as mentioned above and treated with various concentrations (0-500 μg/ml) of bromelain and bromelain plus pero-xidase. The treated cells were incubated for 24 h at 37 ºC and 5% CO2 after the incubation, cells were washed in PBS. After that, cells are suspended in 4% neutral formaldehyde and kept at 37 ºC for 30 to 60 min. Then the cells are stained with 20 µL DAPI solution for 30 min at 37 ºC. The cells were then examined on a slide under a fluorescence microscope and the images were captured. Caspase 3 Activity Assay: ELISA based colorimetric assay kit (E13183, Life Technologies) was used to assay caspase-3 as per the manufacturer’s protocol. In brief, cells were harvested and washed in PBS. The cells were lysed with 1X lysis buffer. After centrifugation the lysate at 5000 rpm, 50 µL of supernatant were put in the well of the plate to which 50 µL of 2 X Z-DEVD-AMC substrate solutions were added. Incubated the mixtures for 30 minutes at room temperature and read the fluorescence at 342/441 nm (excitation/ emission). DNA Fragmentation Assay: DLA cells (1×106cells) were incubated with 500 μg/ml of bromelain and bromelain plus peroxidase for 20 hours at 37 ºC and 5% CO2. Cells were lysed with 1X SSC buffer (20X SSC buffer = 8.76gm of NaCl and 4.412 gm of sodium citrate in 50ml of distilled water) for 1 min. The lysed was incubated with 10µl of RNAase (10 mg/ml) and 25µl of 10% SDS and incubated for 30 min at 35 ºC. After that 20 µl of Proteinase k (20mg.ml) was added and incubated with the lysate for 2 hour at 37 ºC. The DNA was precipitated out with absolute ethanol and 2M NaCl and kept at -80ºC 27, 28. DNA pellets which were obtained, washed with 70% ethanol, air dried and dissolved in sterile distilled water. Electrophoresis was performed in 1% Agarose gel containing Ethidium bromide (0.5 µg/ml). 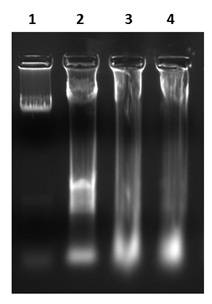 DNA bands are visualized and photographed in Gel documentation system (Minilab, Bio imaging System). 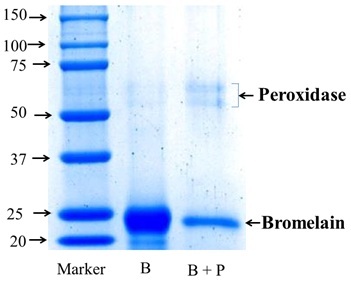 Western Blotting: DLA cells were treated with different concentrations of (0 - 500 μg/ml) bromelain and bromelain plus peroxidase for 24 h. Then proteins of the cell lysates were separated by 12% SDS-PAGE and transferred to nitrocellulose membrane. Membranes were then blocked with 5% non-fat dry milk and immune-labeled with primary antibodies overnight at 4 ºC. To develop the glowing band, the membrane was incubated with HRP conjugated secondary antibody and flooded with ECL substrate (Bio-Rad). Statistical analysis: All values are expressed as mean ± SEM. Statistical significance was compared between various treatment groups and controls using the one-way analysis of variance (ANOVA). Graphical representations were prepared by using Sigma Plot 10.0 version software. Total Protein, Bromelain Activity, and Peroxidase Activity of Crude Extract: After preparation of bromelain from pineapple fruit concentration of total protein in crude extract was measured and was 1.00 ± 0.05 mg/ml. To confirm whether this extract contains active bromelain and active peroxidase, enzyme activity assays were done using their substrate. The activity of bromelain in the crude extract was 63.56 ± 1.8 CDU/ml and the activity of peroxidase was 68 ± 2.64 Unit/ml. Bromelain and Peroxidase Activity in Pure Bromelain: The activity of bromelain in pure bromelain was 86.66 ± 3.21 CDU/ml and the activity of peroxidase was 11.33 ± 1.52 Unit/ml. Determination of Molecular Weight of Bromelain and Peroxidase: The crude extract of bromelain along with peroxidase and commercial bromelain was loaded in a 12.5% gel along with 10-150 kDa protein marker Fig. 1. The band obtained around 23 kDa was of bromelain 22. Additional bands were observed at the range of 50 -75 kDa, which was of peroxidase 22. The activity assay also showed the presence of these enzymes in the extract. Effect of Bromelain Plus Peroxidase on Cytotoxicity: The acetone extract of bromelain plus peroxidase (BM-PR) was screened for its cytotoxicity by MTT assay at different concentrations (50 - 500 µg/ml) and different time point (24 h, 48 h, 72 h). Treatment with bromelain (BM) and BM-PR at different dosage and time point inhibited the proliferation activity of Dalton’s lymphoma (DLA) cells. BM-PR showed higher cytotoxicity compared to only BM at 72 h time point at a concentration of 500 µg/ml Fig. 2. 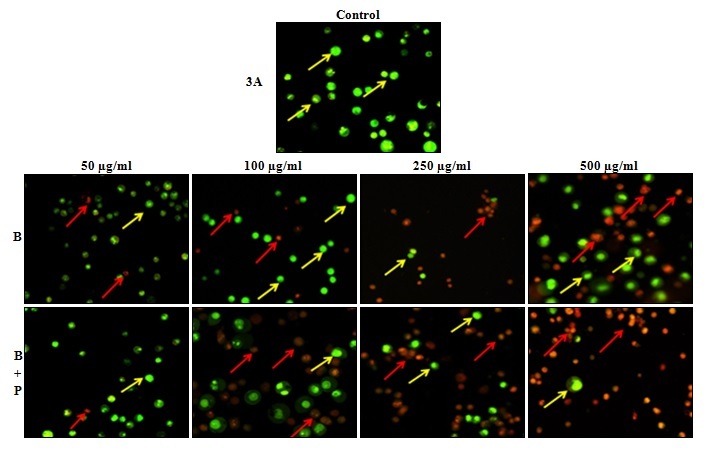 Cellular Morphology Analysis by Acridine Orange / Ethidium Bromide (Ao/EtBr) and DAPI Staining: After treated with BM-PR and only BM for 24 h the numbers of apoptotic cells were measured by staining with Acridine orange / Ethidium bromide and DAPI. In all the concentrations of BM-PR, cells are dying and stained red under fluorescence microscope whereas green cells are alive. In Fig. 3 the numbers of Red cells were much higher than only BM treated cells. Moreover, similar results were found in DAPI stain. 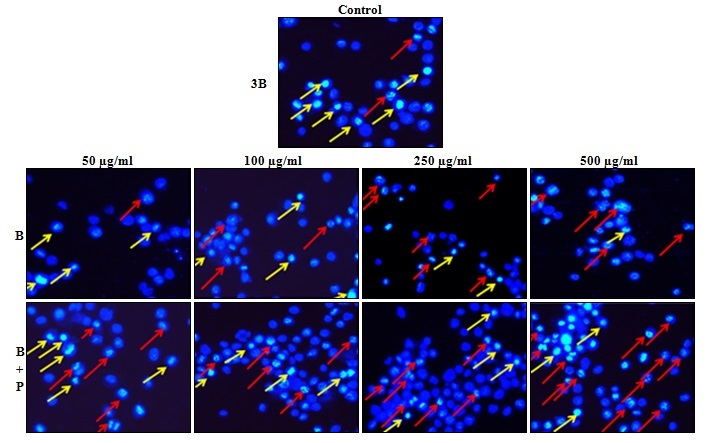 The fragmented nuclei are shown by the red arrow and these numbers are much higher in BM-PR treated cells compared to only BM treated cells at the highest concentration (500 µg/ml). The normal live cell numbers with intact nuclei are very small. DNA Fragmentation Assay: Apoptosis was measured by another simple approach using DNA gel electrophoresis. The efficiency of BM-PR to induce apoptosis of DLA cells was higher compared to only BM and DNA fragmentation was found with smear lane in the gel Fig. 4. DNA fragmentation is one of the biochemical features of apoptosis. During the late stage of apoptosis, DNA is fragmented by different endogenous nucleases which were activated by sequential activation of caspases. For assessment of DNA damage, DLA cells are treated with BM and BM-PR at a concentration of 500 µg/ml for 24 h. DNA damage occurred at 500 µg/ml in BM-PR better than BM alone. Caspase-3 Activity Assay: In apoptosis, the enzymes in caspase cascade pathway will be activated and in the last portion caspase 3 will be activated. Caspases are aspartate directed cysteine proteases that breaks different cytoplasmic substrates in apoptosis. Caspase 3 activity increases in apoptosis. This enzyme activates at the last portion of the caspase cascade pathway. So this enzyme activity is one of the markers of cell death. 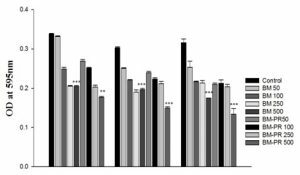 In this study, after treatment with bromelain plus peroxidase, the activity of caspase-3 increased significantly compared to the only bromelain treated cells Fig. 5. This suggests that bromelain plus peroxidase are more pro-apoptotic against lymphoma cells. BM-PR Alters the Levels of p53, Bax, Bad, Cytochrome c and Bcl2 in DLA Cells: Cellular apoptosis via mitochondrial pathway is controlled by a different kind of pro-apoptotic and anti-apoptotic protein family 29. Bax protein causes stimulation and release of cytochrome c from mitochondria to cytosol. 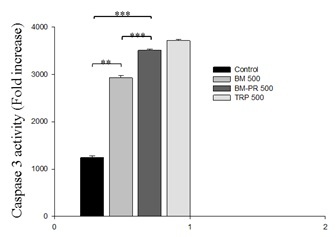 In this study, pro-apoptotic proteins expression including p-53, Bad, Bax and cytochrome c increased significantly after treated with bromelain plus peroxidase compared to control and even this expression was higher than the only bromelain treated cells. On the other hand, anti-apoptotic protein Bcl-2 expression was reduced significantly compared to control or even compared to the only bromelain. Western blotting analysis also reveals that the cytochrome c is the marker of mitochondrial-mediated apoptosis pathway. Cytosolic cytochrome c level is also increased after treatment with bromelain plus peroxidase compared to bromelain alone Fig. 6. From these data, it may be concluded that bromelain plus peroxidase treated apoptosis of lymphoma cells are a mitochondrial-mediated pathways. DISCUSSION: Pineapple from Tripura is a rich source of bromelain along with peroxidase. Though bromelain and peroxidase both are enzymes, There working capacity are depends on whether they are active or not in the pineapple juice. This is confirmed by studying their activity in pineapple extract and by observing the molecular weight of bromelain and peroxidase via SDS PAGE. It also supports the findings of previous literature that acetone fraction of pineapple extract contains bromelain and peroxidase and they active in nature in the Pineapple of Tripura 30. Induction of apoptosis in cancer is one of the best strategies to combat cancer. In this study, we evaluate the effect of bromelain plus peroxidase which was isolated from pineapple fruit from Tripura against commercial bromelain to induce apoptosis in Dalton’s lymphoma cells. MTT assay showed that the antiproliferative activity of bromelain plus peroxidase which is much higher than the only bromelain. Antiproliferative activity is not dependent on the proteolytic activity of bromelain and peroxidase 31. But in this study proliferation is significantly inhibited by the bromelain plus peroxidase enzyme compared to the only bromelain. Various anticancer agents are used to treat cancer Which are inducing apoptosis. During apoptosis, different endonuclease gets activated and this causes breaking of DNA into small oligonucleo-tides 32, 33. To identify the changes in cellular morphology and to compare the effect of bromelain and bromelain plus peroxidase, Acridine orange/ Ethidium bromide and DAPI staining were done. The morphology of cells was found to be transformed after the treatment, showing cellular shrinkage, membrane blabbing, and typical nuclear fragmentation in case of AO/EtBr staining 34. In our study, it was found that after treatment with concentration starting from 50, 100, 250, 500 µg/ml for 24 h, the numbers of apoptotic cells are increased significantly in case of bromelain plus peroxidase. This may be due to the additive effect of peroxidase with bromelain. Through, our microscopy, the morphological structure indicates that the number of death of DLA cells is more after treated with bromelain plus peroxidase compared to bromelain only. Both the enzymes present in the pineapple fruit extract and are protease in nature which additively induces apoptosis to lymphoma cells. Caspases, the cysteine proteases, play a significant role to stimulate apoptosis by fragmenting DNA of the cell 35. Caspase 9 is activated first through the mitochondrial apoptotic pathway. Then activated caspase 9 initiates the proteolytic activity of other downstream caspases like caspase-3. DNA cleavage at the site of the protein containing structure nucleosome by caspase-3 is a key feature of apoptosis when histone proteins are exposed at the site of fragmentation 36. 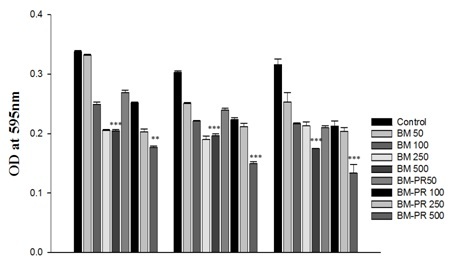 In this present study, the levels of the caspase 3 in DLA cells increases significantly after treated with bromelain plus peroxidase at a dose of 500 µg/ml. This may be due to the presence of peroxidase with bromelain induces the caspase-dependent apoptotic pathway by stimulating different caspases. Earlier it is reported that bromelain induces apoptosis via inhibiting the translocation of NF-κB 37. In our study, we found that p53 expression in DLA cells is very low. But after treatment with bromelain plus peroxidase, the expression of p53 is increased significantly 38. 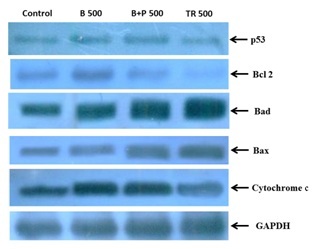 Expression of Bax, Bad and cytochrome c is also increased 39. 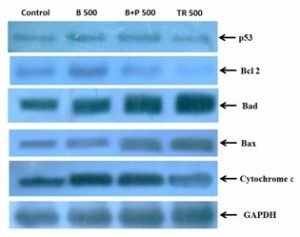 Other than this the anti-apoptotic protein Bcl2 expression level is decreased after treated with bromelain plus peroxidase. Bcl2 appear to directly or indirectly preserve the integrity of the outer mitochondrial membrane, thus preventing cytochrome c release and cell death initiation through the mitochondrial pathways 40. As the data showed higher expression of cytochrome c after treatment with bromelain plus peroxidase, the apoptosis induced through the mitochondrial-dependent pathway and this may be due to the additive effect of peroxidase along with bromelain which causes stimulation of mitochondria-dependent apoptotic pathway. These peroxidases stimulate the activity of bromelain which increases the up regulation of pro-apoptotic proteins and down-regulation of anti-apoptotic proteins. CONCLUSION: In conclusion, we have explained that the extract from pineapple fruit contains bromelain and peroxidase and these two compounds together show the antiproliferative/ apoptotic effect on Dalton’s lymphoma cells in-vitro. From the data we obtained, it may be suggested that bromelain plus peroxidase are involved in inhibition of proliferation of lymphoma cells as well as an inducer of apoptosis through mitochondrial pathway. Such effect of bromelain plus peroxidase may exist in in-vivo lymphoma model which is not yet studied. This in-vitro experiment motivates us to go for the in-vivo studies in future with lymphoma model. However, from this study, it is clear that pineapple fruit juice might be more potent to prevent the lymphoma disease and can be used commercially. ACKNOWLEDGEMENT: The Authors are grateful to Department of Biotechnology, Government of India, for funding [Grant Number: BT/472/NE/TBP/2013; Dated 13th March 2014]. We highly acknowledge State Biotech Hub, Tripura University for supporting infrastructure. Siegel R and Jemal A: Cancer statistics. CA: A Cancer Journal for Clinicians 2016; 66: 7-30. Harvey AL, Edrada-Ebel R and Quinn RJ: The re-emergence of natural products for drug discovery in the genomics era. Nat. rev. Drugs Disc. 2015; 14: 111-129. Shen B: A New Golden Age of Natural Products Drug Discovery. Cell. 2015; 163: 1297-1300. Yuan H, Ma Q, Ye L and Piao G: The Traditional Medicine and Modern Medicine from Natural Products. Molecules. 2015; 21: 1-18. Fridlender M, Kapulnik Y and Koltai H: Plant derived substances with anti-cancer activity: from folklore to practice. Frontiers in Plant Science 2015; 6: 1-9. Shaikh RU, Pund MM, and Gacche RN: Evaluation of anti-inflammatory activity of selected medicinal plants used in Indian traditional medication system in-vitro as well as in-vivo. J Tradit. Compl. Med. 2016; 4: 355-361. Kalpana MB, Prasath GS and Subramanian S: Studies on the anti diabetic activity of Ananas comosus leaves in STZ induced diabetic rats. Der. Pharmacia. Letter 2014; 6: 190-198. Miller AB, Cates RG, Lawrence M, Soria JA, Espinoza LV, Martinez JV and Arbizú DA: The antibacterial and antifungal activity of essential oils extracted from Guatemalan medicinal plants. Phar Bio 2015; 53: 548-54. Mohapatra A, Rao MV and Ranjan M: Comparative study of the increased production & characterization of Bromelain from the peel, pulp & stem pineapple (Ananas comosus). 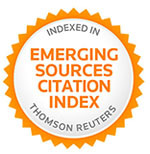 International Journal of Advancements in Research & Technology 2013; 2: 249-279. García BL, Hernández M and Segundo BS: Bromelain, a cysteine protease from pineapple (Ananas comosus) stem, is an inhibitor of fungal plant pathogens. Lett. Appl. Microbiol. 2012; 55: 62-7. Ketnawa S, Chaiwut P and Rawdkuen S: Aqueous Two-phase Extraction of Bromelain from Pineapple Peels (‘Phu Lae’ cultv.) and Its Biochemical Properties. Food Sci. Biotechnol. 2011; 20: 1219-1226. Anjos DMM, Silva DAA, Pascoli DIC, Mikcha JM, Machinski MJ, Peralta RM and Filho ADBA: Antibacterial activity of papain and bromelain on Alicyclobacillus spp. Int. J. Food Microbiol. 2016; 216: 121-6. Hale LP: Proteolytic activity and immunogenicity of oral bromelain within the gastrointestinal tract of mice. Int Immunopharmacol. 2004; 4: 255-264. Praveen NC, Rajesh A, Madan M, Chaurasia VR, Hiremath NV and Sharma AM: In-vitro Evaluation of antibacterial efficacy of pineapple extract (Bromelain) on periodontal pathogens. J. Int. Oral Health 2014; 6: 96-8. Engwerda CR, Andrew D, Murphy M and Mynott TL: Bromelain activates murine macrophages and natural killer cells in vitro. Cell Immunol. 2001; 210: 5-10. Fouz N, Amid A and Hashim YZ: Gene expression analysis in MCF-7 breast cancer cells treated with recombinant bromelain. Appl. Biochem. Biotechnol. 2014; 173: 1618-39. Bhui K, Tyagi S, Prakash B and Shukla Y: Pineapple bro-melain induces autophagy, facilitating apoptotic response in mammary carcinoma cells. Biofac. 2010; 36: 474-482. Engwerda CR, Andrew D, Ladhams A and Mynott TL: Bromelain modulates T cell and B cell immune responses in-vitro and in-vivo. Cell Immunol. 2001; 210: 66-75. Batkin S, Taussig SJ and Szekerezes J: Antimetastatic effect of bromelain with or without its proteolytic and anti-coagulant activity. J Cancer Res Cli Onc 1988; 114: 507-8. Chaurasiya RS and Hebbar HU: Extraction of bromelain from pineapple core and purification by RME and precipitation methods. Separation and Purification Technology 2013; 111: 90-97. Gautam SS, Mishra SK, Dash V, Goyal AK and Rath, G: Comparative study of extraction, purification and estimation of bromelain from stem and fruit of pineapple plant. Thai J. Pharm. Sci. 2010; 34: 67-76. Swaroop GG and Viswanathan G: Isolation and Characterization of Bromelain (BML) Proteases from comosus an asset to Cancer Chemotherapy. 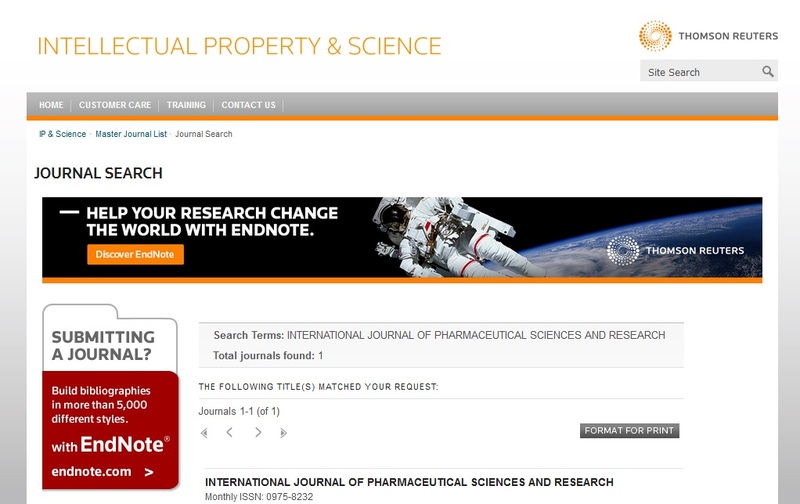 International Journal of Pharmacology and Toxicology 2013; 1: 82-90. Brunelle JL and Green R: Chapter Thirteen - Coomassie Blue Staining. Methods in Enzymol. 2014; 541: 161-167. Rubila S, Ranganathan TV and Sakthivel KM: Protective effect of Zingiber officinale against dalton's lymphoma ascites tumour by regulating inflammatory mediator and cytokines. Biochem. Biotech 2016; 180: 1482-1496. Chatterjee N, Das S, Bose D, Banerjee S, Jha T and Saha, K.D: Lipid from Infective L. donovani Regulates Acute Myeloid Cell Growth via Mitochondria Dependent MAPK Pathway. PLoS One 2015; 10. Roxan B, Lopas MT, Salas CE and Martha H: In vivo anti-tumoral activity of stem pineapple Bromealin. Planta Med. 2007; 73: 1377-1383. Saadat YR, Saeidi N, Vahed SZ, Barzegari A and Barar J: An update to DNA ladder assay for apoptosis detection. , BioImpacts. 2015; 5: 25-28. Saadat YR, Saeidi N, Vahed SZ, Barzegari A and Barar J: An update to DNA ladder assay for apoptosis detection. Bioimpacts 2015; 5: 25-28. Yuan H, Sun B, Gao F and Lan M: Synergistic anticancer effects of andrographolide and paclitaxel against A549 NSCLC cells. Pharm. Biol. 2016; 54: 2629-2635. Ghosh R, Chakraborty J and Ghosh D: Journal of Applied Bioscience 2008; 34: 106-109. Romano B, Fasolino I, Pagano E, Capasso R, Pace S, Rosa GD, Milic N, Orlando P, Izzo, AA and Borrelli, F: The chemopreventive action of bromelain, from pineapple stem (Ananas comosus), on colon carcinogenesis is related to anti-proliferative and proapoptotic effects. Mol. Nutr. Food Res. 2014; 58: 457-65. Fouad AY and Aanei C: Revisiting the hallmarks of cancer. Am. J. Cancer Res. 2017; 5: 1016-1036. Adiguzel Z, Ozalp-Yaman S, Celik G, Salem S, Bagci-Onder T, Senbabaoglu F, Cetin Y and Acilan C: A platinum blue complex exerts its cytotoxic activity via DNA damage and induces apoptosis in cancer cells. Chem. Biol. Drug Des. 2017; 90: 210-224. Dolai N, Islam A and Haldar PK: Anti-proliferative activity and apoptosis inducing mechanism of Anthocephalus cadamba on Dalton’s lymphoma ascites cells. Iran J. Pharm. Res. 2016; 15: 505-514. Man SI and Kanneganti TD: Converging roles of caspases in inflammasome activation, cell death and innate immunity. Nat Rev Immunol. 2016; 1: 7–21. Bell RAV and Megeney LA: Evolution of caspase-mediated cell death and differentiation: twins separated at birth. Cell Death and Differentiation 2017; 24: 1359-1368. Bhui K, Tyagi S, Srivastava AK, Singh M, Roy P, Singh R and Sukla Y: Bromelain inhibits nuclear factor kappa-B translocation, driving human epidermoid carcinoma A431 and melanoma A375 cells through G(2)/M arrest to apoptosis. Mole. carcinog. 2012; 51: 231-243. Kim S and Seong SAA: Role of p53 isoforms and aggregations in cancer. Medicine. 2016; 95: 26. Zhao G, Zhu Y, Eno CO, Liu Y, De-Leeuw L, Burlison AJ, Chaires JB, Trent OJ and Lia C: Activation of the Proapoptotic Bcl-2 Protein Bax by a Small Molecule Induces Tumor Cell Apoptosis. Molecular and Cellular Biology 2014; 34: 1198-1207. Zhou J, Lu GD, Ong CS, Ong CN and Shen HM: Andrographolide sensitizes cancer cells to TRAIL-induced apoptosis via p53-mediated death receptor 4 up regulation. Mol. Cancer Ther. 2008; 7: 2170-2180. Debnath R, Majumder D, Singha AK, Ghosh D and Maiti D: Bromelain plus peroxidase from pineapple induces apoptosis via mitochondrial dependent pathway in lymphoma cells. Int J Pharm Sci & Res 2018; 9(11): 4610-18. doi: 10.13040/IJPSR.0975-8232.9(11).4610-18.